If you have a website, you likely understand the importance of SEO. To put it simply, SEO is everything. It is the reason that people find websites, buy products, and trust businesses. If you have a solid SEO strategy, you will be on top of the world. If you have a weak strategy, you will get buried among the competition. There is a good chance that you’re currently getting buried, all because you don’t know how to supercharge your SEO campaign. You try and you try, but you can’t make it to the first page on the search engines. As long as other sites are outranking you, you aren’t going to be top dog in your niche. Fortunately, you don’t have to continue losing out to the competition. Once you buy private proxies, you can combine them with some SEO techniques to hypercharge your campaign. Then, you won’t have any trouble taking your competitors out one by one. You will make it to the top, and it won’t even take that long. Let’s take a look at some of the strategies you can incorporate once you buy private proxies. Use them all so you can get the results you want in the shortest time possible. Once you are done, you will finally know what it feels like to be the top dog. Many site owners skip doing their competitor research, which is why they can never rise to the top of the search engines. Competitor research is a key to any solid SEO campaign. While there are lots of different options for competitor research, backlink research is one of the most powerful. Search engines analyze backlinks when determining rankings. If you don’t have the right backlinks, you won’t be able to compete with other sites, no matter how hard you try. Once you find out which backlinks your competitors have, you can get the same ones and move up in the rankings. You don’t need all of your competitors’ backlinks. You just need the ones with solid page ranks. If you can replicate those links, you will match up with your competitors in regards to backlinks. This will put you on even footing with them. Then you can do some link building on your own to pull ahead of them. In the old days, people conducted their competitor research on their own, but that is incredibly time-consuming. This isn’t the old days anymore. Now, you can use a tool like Ahrefs or Majestic to do the dirty work for you. You can put your keywords into the tool, and then it will analyze your competitors. You will find out where they are getting their links. Click on the links to find out how they received them. It might be something as simple as a blog comment or something as complex as a guest blog post. You need to replicate the linking strategy in order to get the link. This might take a little bit of time, but it is well worth the effort. It’s important to understand that if you use a tool that searches for a lot of URLs or makes a lot of queries at once, you might get banned while doing your competitor research. That is where a proxy can help. Add your proxies into your search engine or the tool, and then you don’t have to worry about getting banned. You can find out everything that you want to know about your competitors with a click of the mouse. Data is a huge part of SEO. If you use a data scraper, you can harvest all kinds of information that you can use for SEO purposes. Do not try to do this without a tool. It will take forever, and you won’t get the same types of results you can get with a tool like ScrapeBox. With the help of a tool, you can speed up the process and then use the information to improve your SEO campaign. ScrapeBox provides a multi-threaded operation, so it runs a bunch of tasks at once. If you fail to buy private proxies to use with ScrapeBox, the search engines will ban you right away. You have to use dedicated proxies with this service, or it just won’t work. Once you have your dedicated proxies set up with ScrapeBox, there will be no limit to what you can do. Let’s look at some of the best scraping features provided with this tool. First, there is the search engine harvester. This tool scrapes URLs from a variety of search engines. 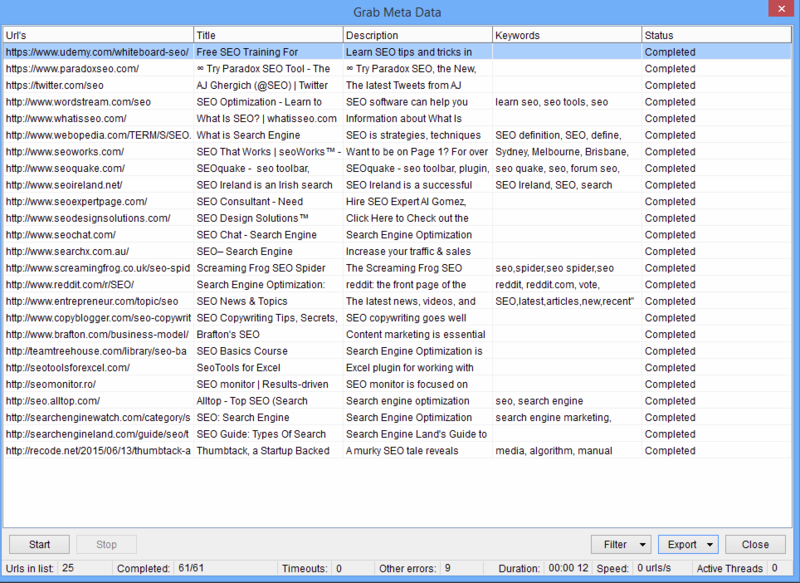 You can go beyond Google and Bing and get data from more than 30 search engines with this tool. That is great news since the more data you gather, the more powerful you can be online. When you have a lot of data at your disposal, you will be unstoppable. You’ll just need to put in keywords related to your niche and then let the search engine scraper get to work. Once you get the information, you can do a variety of different things with it. You can find blogs that you should comment on to get backlinks, and you can get some important information related to your keyword. In fact, you can come up with an entire SEO strategy based on the information that you get from the scraper. You can also use the keyword harvester to find long-tail keywords related to your main keyword. As you probably know, search engines analyze your keywords whenever they rank your site. If you just use short keywords, you’re going to have a hard time ranking your site. Long-tail keywords are more targeted and search engine friendly than short keywords are. Be sure to use the keyword harvester so you can find the best keywords out there. Then, you need to put them on your site and in the content that you use to promote your site. Use one keyword per page or piece of content. That way, you can rank for a variety of keywords. The webpage meta scraper is another great tool provided by ScrapeBox. This tool scrapes the meta description, keywords, and page title from websites. Coming up with the right meta data and titles is hard work. In fact, some people pay SEO experts thousands of dollars to do this task for them. Instead of spending all of your money, you can find out what your competitors are using and then piggyback off of them. Just remember that you need to use different meta data for each page of your website. If you use the same data for every page, you won’t reach your full SEO potential. If you get ScrapeBox, you can make use of other features, as well. Use the comment poster, link checker, and additional features so you can build a powerful online presence. You will do some link building when you conduct your competitor research. However, you don’t want to stop when you have the same links as your competitors. You want to have more links than they do so you can move past them in the rankings. At one time, people used to do all of their link building on their own. They went from one site to the next, building links. It would take them months to get any real results since it was such a slow process. Now, though, you can speed up the process by using a tool. The GSA Search Engine Ranker is one of the best link building tools out there. You just need to enter your keywords and website into the tool, and then it will do the rest. Of course, you need to use proxies or your link building efforts will come to an end prematurely. You will get banned before you’re able to build all of your links. One of the best things about this tool is it continues to create backlinks for as long as you want. You should always work to get new backlinks, so this is really important. You don’t want to stop creating backlinks just because you make it to the top of the search engine rankings. There will always be people out there trying to outrank you, so you have to stay active with your link building efforts. Otherwise, you will lose your ranking. With that in mind, keep this software active at all time. Let it continue building links for you, even if you’ve achieved the coveted top spot. That will make it difficult for your competitors to catch you. Most SEO experts agree that search engines are using social cues as a ranking factor. In other words, these search engines look at how many people talk about your page on social media. They also analyze “Likes,” “Shares,” and other social cues. If you’re running a small business, it can be hard to make your social media accounts spread like wildfire. That’s where dedicated proxies can help. When you use proxies, you aren’t limited to a single social media account. You can use the proxies to create as many social media accounts that you want. Then, you can use each account to go after your target market. You can test different strategies with your various accounts and find out what works. If you do this correctly, you can build up quite a social media following. If that sounds difficult, you can get some help. There are tons of social media automation tools out there that work with proxies. You can use Buffer or Hootsuite, or you can go with a bot, like Instagress. You can use the tools to schedule your posts so you don’t have to spend as much time on the computer. The bots take it a step further by automating the entire social media experience. You can use bots to find people to follow, “Like” and “Share” content, send comments, and more. Bots make it easier to get a big following on various social networks. Search engines are more likely to give you a great ranking if they think that people want to find you. It can take a lot of time to build a following, but you can automate the process and get much faster results. Again, you need to use a tool in order to accomplish this. SEnukeTNG has a crowd searcher feature. The software makes it look like people are going to Google, searching for your keyword, and clicking on your website. You can get thousands of searches and clicks using this tool. Then, the search engine will think that you have a hot site. It will make it even easier for people to use your site by boosting it up in the rankings. This is a great way to fly past your competitors quickly. Then, once you are on top, you will get a lot of organic traffic. It is critical that you use a private proxy when you automate traffic, though. Otherwise, it will look like all of the traffic is coming from the same place. Then, instead of getting credit for thousands of visits, you will get credit for a single visit. That won’t move you up in the rankings. If you use a proxy, though, it will look like the traffic is coming from different places. Start your SEO campaign by buying some private proxies. Once you have your proxies, add in a piece of software and get to work. You will be amazed by how quickly you can build an online presence when you combine proxies and SEO tools. These tools help you do things at a hyper speed, and the proxies protect your identity. They pack a powerful one-two punch and help you rise to the top of the rankings. Once you are there, you can enjoy all kinds of traffic. Then, you can sell more products and services and enjoy all of the benefits that come with a great ranking in the search engines.